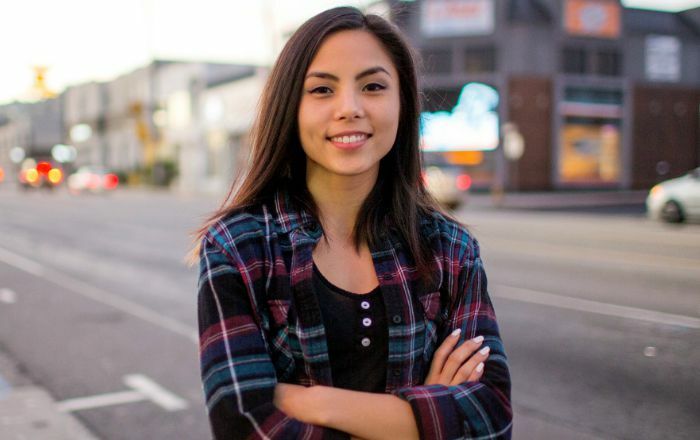 Anna Akana is an American actress, filmmaker, and comedian who gained visibility among the internet masses with her self-titled YouTube channel. Hr channel has more than 1.9 million subscribers and also co-hosts the podcast ‘Explain Things to Me.’ She has starred in films as well as television series including her recurring roles in TV series, Stitches and Corporate. She has also created several web series of varied themes. Anna Akana was born on 18 August 1989, in California, United States. Her ancestry is Japanese, Filipino, Hawaiian, Irish, German, Spanish, French, and English. Anna wanted to become a veterinarian but the suicide of her 13-year-old sister Kristina completely changed her life. She stopped laughing for months and it was only after watching a comedy show did she start laughing again. She dropped out of college to purse comedy after realizing that comedy can change anyone’s life. Anna Akana has been dating hip-hop artist, George Watsky from 2017. She previously dated actor and comedian, Brad Gage and YouTuber Ray William Johnson. In 2013, Anna Akana debuted in the sketch comedy movie, Inappropriate Comedy, alongside Adrien Brody, Lindsay Lohan, and Michelle Rodriguez. Her film credits include Ant-Man, Kids vs Monsters, Dirty 30 and You Get Me. In 2011, Anna starred in an episode titled “Knocker Nightmare” of the teen comedy TV series, Awkward. She played the role of Asian girl in the TV series. Her other notable TV series include The Beauty Inside, The Fosters, Stitchers and Corporate. Anna has appeared in a number of TV commercials including Pepsi, Best Buy and Truth (Anti-smoking PSA). Her net worth is estimated to be $0.4 million as of 2018. After several months of her sister’s death, she laughed for the first time when watching a Margaret Cho special on Comedy Central. This was her inspiration for pursuing comedy as she saw it as a means of helping her move on with her life. She is a animal lover, particularly cats. She has 6 pet cats – Jimmy, Lily, Congress, Abby, Ghost, and Beetle. in 2013, Anna published a book called Surviving Suicide which contains her journal entries from the two years after her sister’s death. In 2014, Anna joined hands with comedian and writer, Megan Rosati to form a comedy music duo, called Cat Benatar. in 2014, she received Digital Pioneer Award at San Diego Asian Film Festival. In 2015, she launched her own clothing called Ghost & Stars which features leggings, t-shirts, and formal dresses. She has produced numerous web series such as10 Second Traumas, Oscar’s Hotel for Fantastical Creatures, Transformers: Combiner Wars and Miss 2059 among others.